If you use this site you accept the terms and conditions below. Protection of your personal information online is of great importance to me. Practices followed in the use of information through this website, TheFengShuiStudio.com, are noted in the Policy below. Use of this site implies agreement with the use of information set forth in the Policy. I am not responsible for republished content from this blog on other blogs or websites without my permission. Should you wish to republish some part of this blog you must obtain permission. If you have any questions please feel free to contact me directly at caroldaigneault@gmail.com. Anything readers share on this site is considered not confidential and non-proprietary. I can refuse to post anything I deem inappropriate for this site including reader input that is threatening, abusive or unlawful. All posts reflect views of their authors. You are responsible for your own interactions. I can remove content made by readers at any time without notice. Content of this blog is a source of income for me and may therefore be used for promotion. I only share products and services of others that I have personally used or experienced and the opinions expressed are mine alone and based on my own experiences of the products or services. I am not responsible for the content of linked sites. My intention is to provide my readers with the most useful, interesting and encouraging content possible. Information on this website is provided for information purposes only. It is the responsibility of users to evaluate accuracy, completeness or usefulness of information on this site or a linked web site. All information on this website is provided “as is” and without warranty. I am not responsible and don’t endorse anyone else’s comments on this site except my own. I am not responsible for capabilities or reliability of products or service obtained through links on this website. What I post is accurate to my best knowledge but errors may occur. Changes and updates may be made periodically to this website without notice. 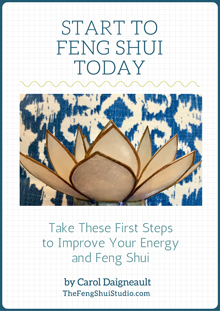 All specific Feng Shui and other advice is given as a suggestion only. It is the responsibility of the recipient to evaluate the usefulness of the information for them. My graphics and artwork may be printed on paper for personal use only. The images may not be altered, cropped or changed in any way. They may not be reproduced for resale, mass distribution or any other commercial purposes. All images are © Carol Daigneault under both United States and international copyright laws unless otherwise stated. Please do not use any content of this website without express written consent.